After three months in Asia, we made our way to Europe. We have planned to spend about 7 weeks in Europe for multiple reasons but mostly because we are running out of funds and Europe can be a bit pricy compared to South America and Asia. 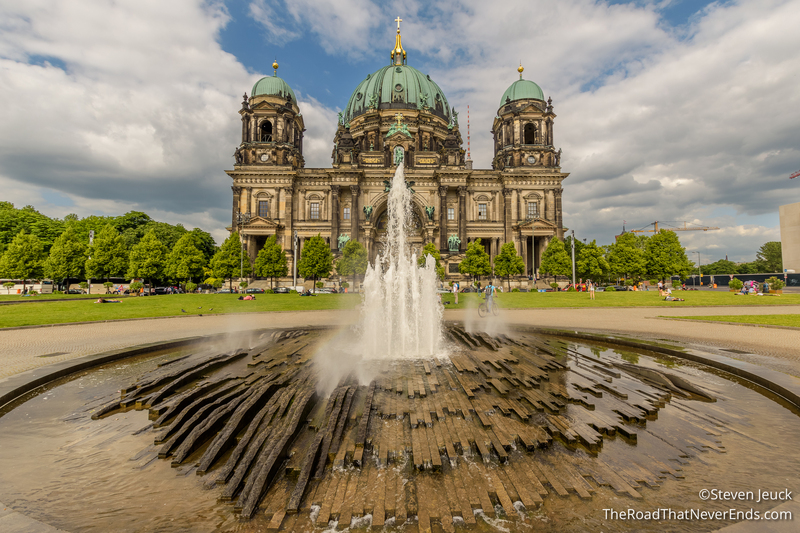 Our Europe trip started with Berlin! 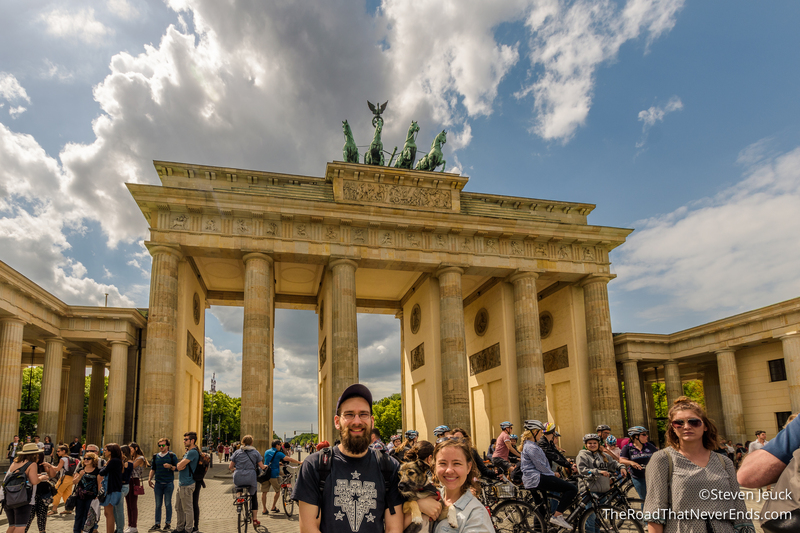 We picked Berlin as our first stop so we can see some friendly faces – Nina and Ludwig! Nina and Ludwig have been living in Berlin for almost a year and were nice enough to offer us a bed, tour of Berlin and some much needed rest. Berlin is the most populated city in Germany with 3.7 million people. Before being the capital to Germany it served as capital to Margraviate of Brandenburg, Kingdom of Prussia, German Empire, Weimar Republic and the Third Reich (Nazi). 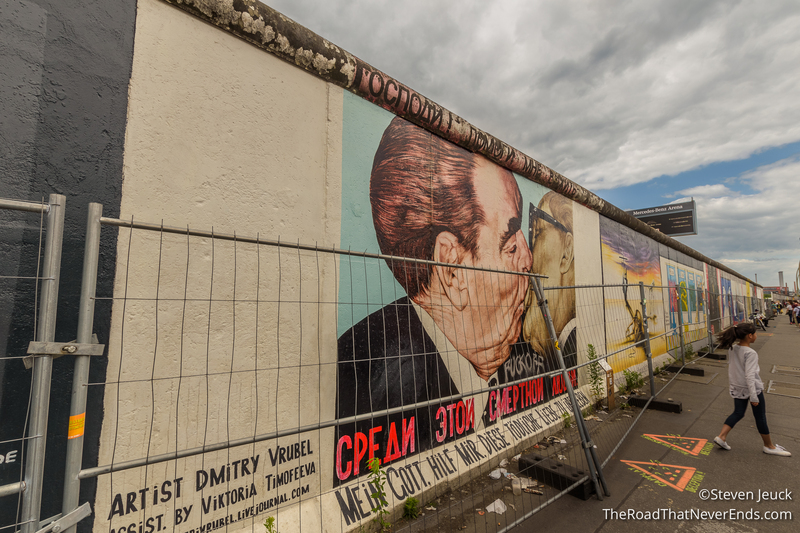 After WWII Berlin was split between Russia and Western Allies and wasn’t reunified until 1990. Today, Berlin is home to culture, arts, tech, media, science and more – with a booming economy. 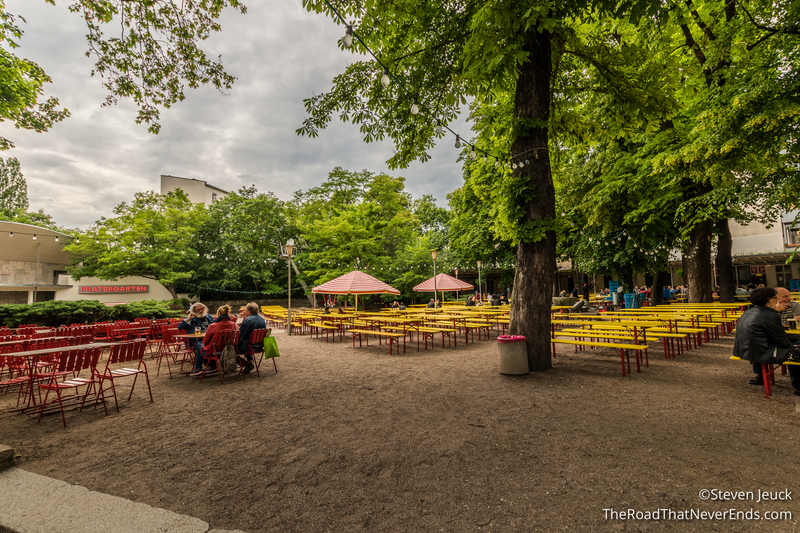 For me, Berlin is a mixing pot – you can walk around with your dog visiting the many city parks, spend your lunch watching the city’s orchestra, wear whatever you want, be a tech geek, really – the possibilities are endless. This reminded me a bit of San Francisco… but without the urine smell. People just live their lives, engaging in community and being good neighbors – but also with a sense of individuality. I can see why Nina and Ludwig truly love living here. We took a flight from Tokyo to Dusseldorf that left Tokyo at 11:00AM. The flight was on ANA, and wasn’t that bad. The 12 hours seemed to go by really quick. The plane had some movies and live news – so I filled up with news about the UK election while Steve dozed through a Pirates of the Caribbean movie. I also got to watch the new live action Beauty and the Beast. I really liked it. Once we arrived in Dusseldorf, we went through the quickest and easiest immigration. Even though the immigration officers were a bit rough around the edges, the process was seamless. We had a four-hour layover in Dusseldorf which was harder to pass. We tried to find a working ATM with no success. We bought a light dinner and passed the time with reading our books. Turns out our flight was delayed by 15 and then 30 minutes, but all worked out. The flight to Berlin was an hour and quick. In Berlin we took a mixture of public transportation – bus, tram and metro (U-Bahn). All were very simple and cheap to use. We were super stoked to have stayed with Nina & Ludwig. Not only did it save us a lot of money, we enjoyed our late night pajama talks, eating breakfast with messy hair and cuddle time with their cute little dog, Bonny. It is always nice to chit chat for hours and hours with friends and finally look at your watch and say, “holy cow its almost 2AM”. We got to share our travel stories with Nina, who she herself embarked on her own travel journey less than 2 years ago and also talk about how navigation seems to trouble every couple . Overall, they were gracious and lovely hosts and we are so grateful for their friendship. I really can’t wait to go back and visit them. Eating was a big part of our Berlin experience, and of course you didn’t have to twist our arms to get us to enjoy tasty beer. From vegan tacos, to German sausages, the food was delicious. A particular favorite spot was the nearby Beer Garden. 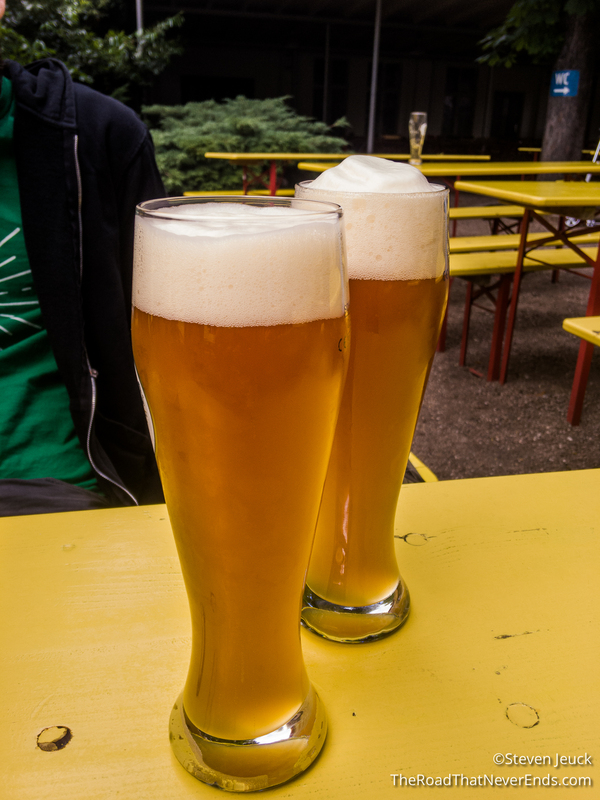 Berliner Weizen (Red & Green) – Nina had recommended we try this out. It is Berlin White Beer with added raspberry or waldmeister flavoring. The red one was a bit too much sugar, we all voted that the green one was tastier. 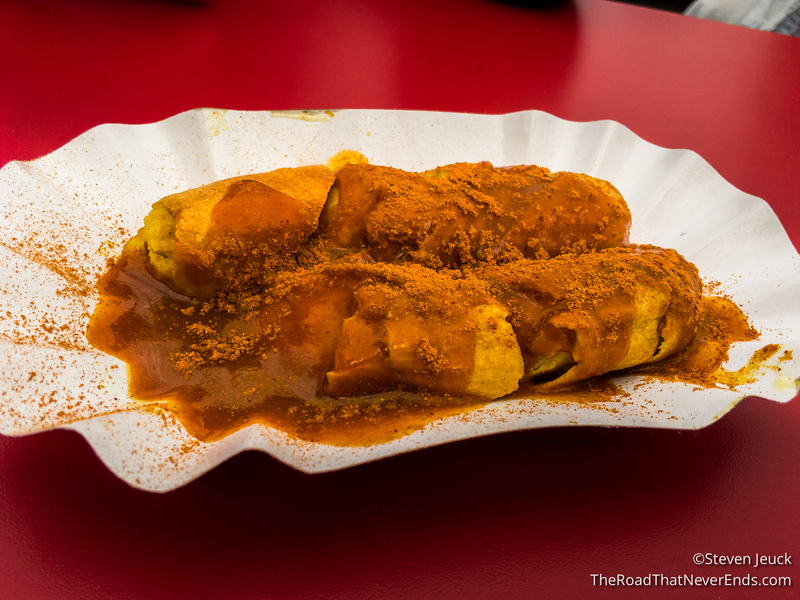 Currywurst – Known as one of Berlin’s famous foods since WWII, we had to give it a try. We ended up sampling one at a stand near the Wall. The sausage is covered in tomato sauce and curry powder. It was not overly curry, little bit messy, and a whole lot of yummy. 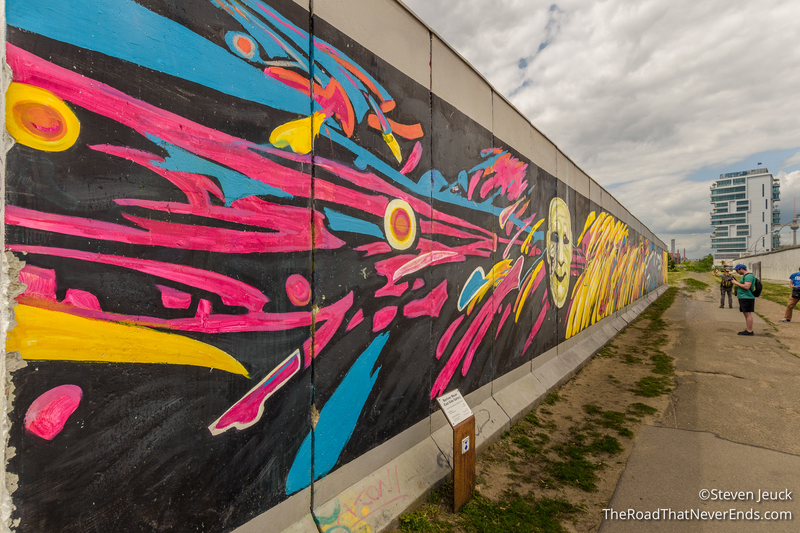 Berlin Wall (East Side Gallery) – We spent some time walking down the Berlin Wall to check out the East Side Gallery. The art was originally painted in 1990 from over 102 artists. 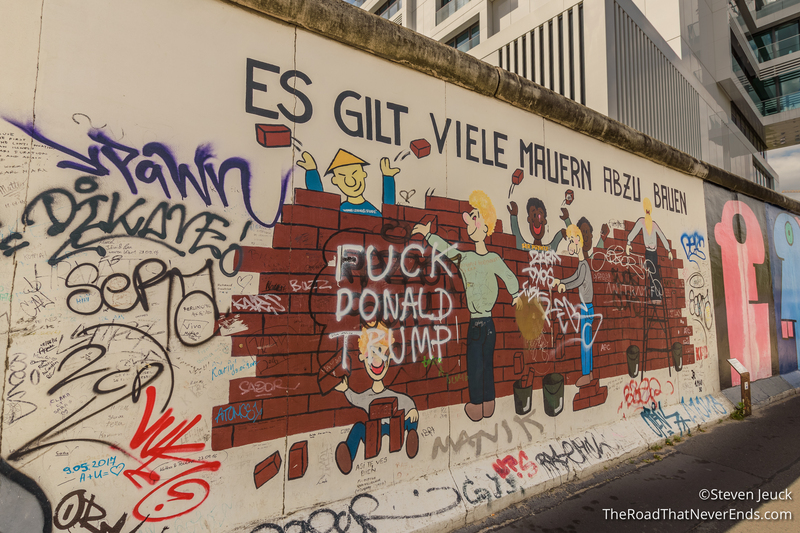 The wall is also periodically covered from locals that reflects their views of current events. Like going to any art gallery, there are favorites and ones that are hard to understand. We enjoyed our stroll down the gallery. 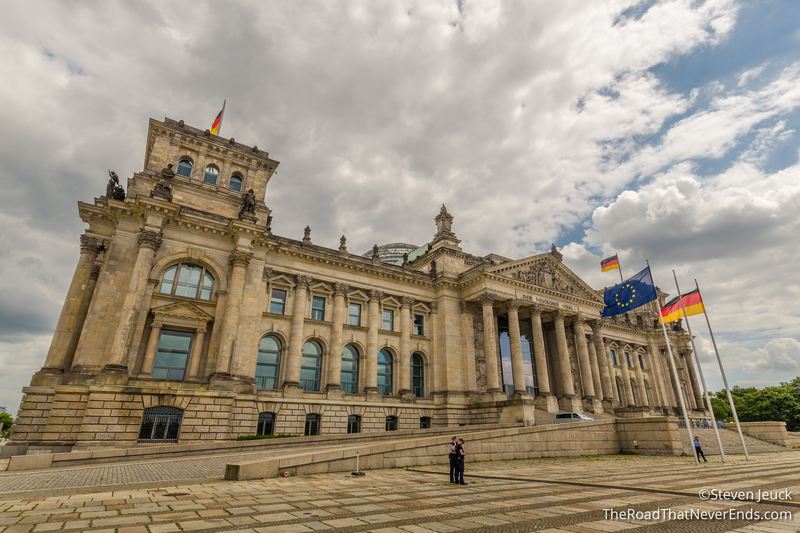 Reichstag Building – Originally built in 1894, and served for the government until a fire put it in disrepair in 1933. It was repaired after the unification in 1990, and reopened in 1999. It is a beautiful building with a wonderful park in front filled with lunch goers, music players and robot dancers. 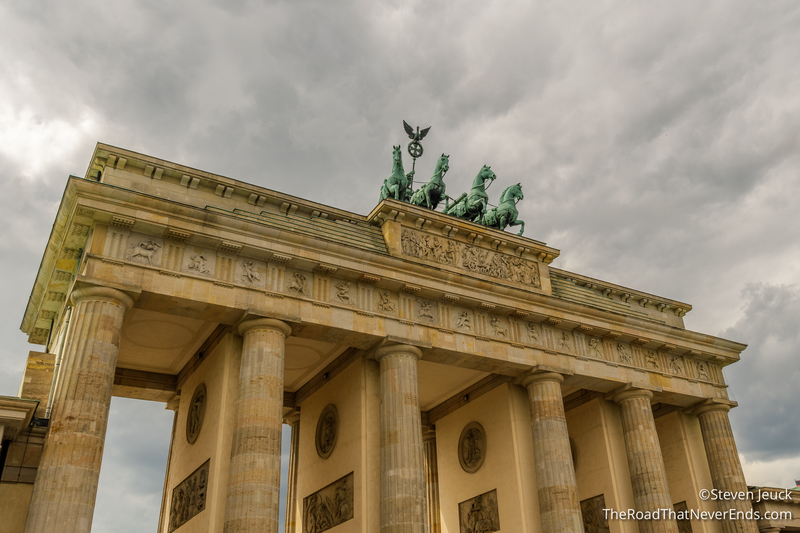 Brandenburg Gate – Built in 1791, it served as the gate to the road to Brandenburg on orders of the then Prussian King. It is often recognized as the gate President Ronald Reagan stood in front of when he declared to “Tear Down This Wall”. 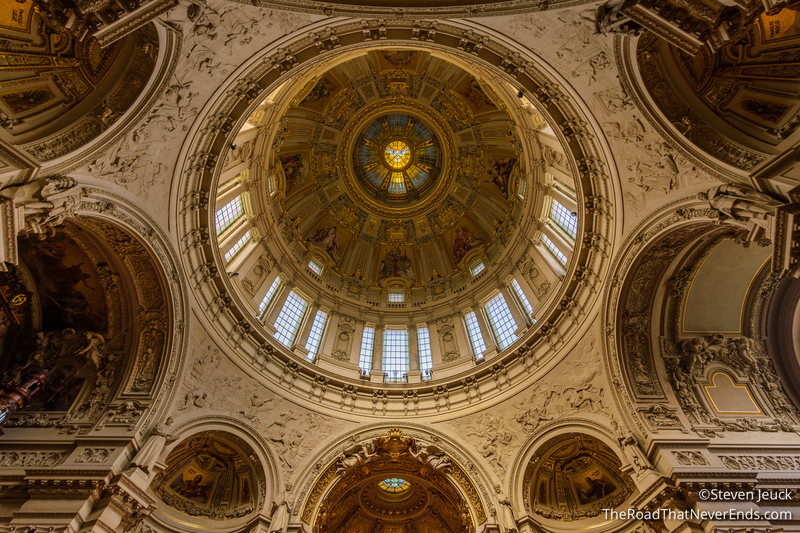 Berlin Cathedral – Originally built in 1451, but has been rebuilt several times. The last major rebuild was 1905, with a major renovation being done in 1993. Although the name may imply it is a Catholic church, it is not. It is actually member of the Evangelical Church of Berlin (a Protestant Church). 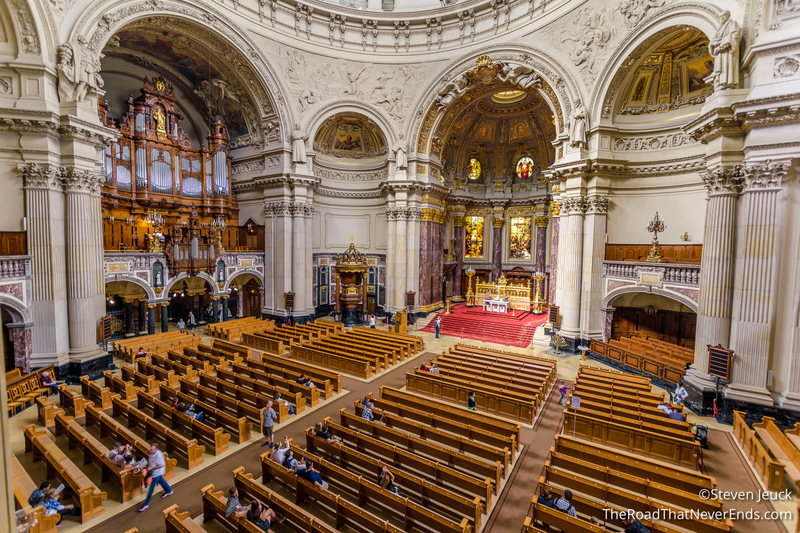 It was a catholic church until the time of reform in 1539. The church has an interesting museum attached, impressive views of the city and a creepy but cool crypt. 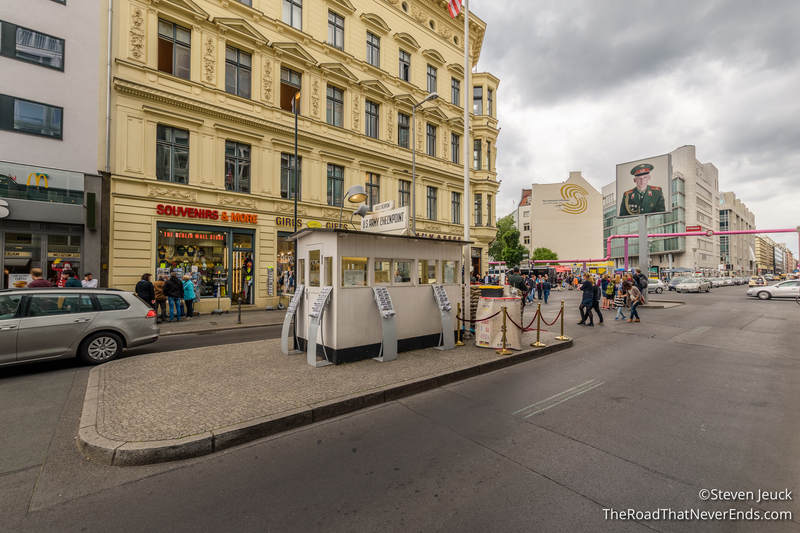 Checkpoint Charlie – The crossing point between East & West Berlin during the Cold War. Once the scene of the now iconic tank standoff, during the Berlin Crisis of 1961 – today it is a popular tourist attraction where you can pay to take a photo with actors ($), eat at a McDonalds, and checkout the open air museum. 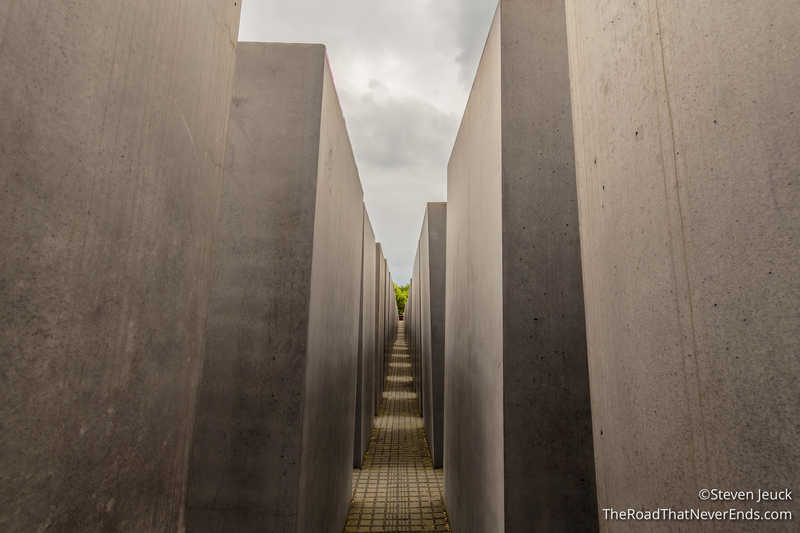 Memorial to the Murdered Jews of Europe – This memorial and museum is worth the visit if you ever make it to Berlin. 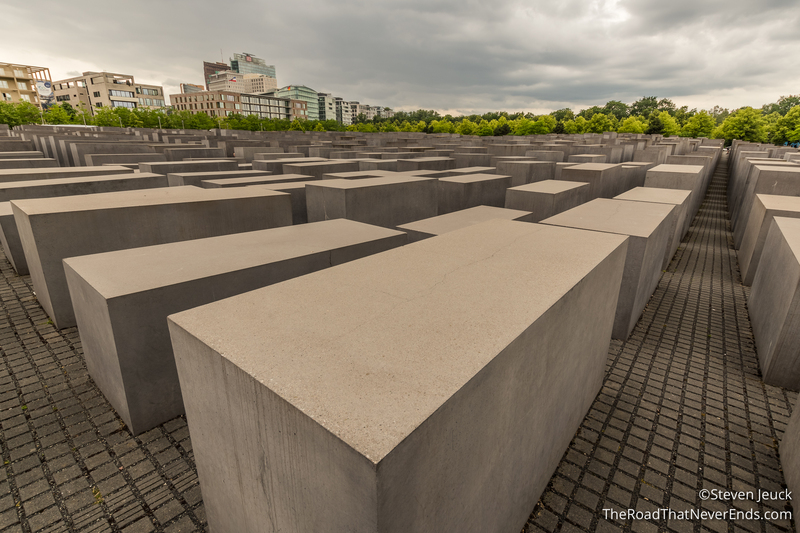 The memorial opened in 2005 close to the Brandenburg Gate. 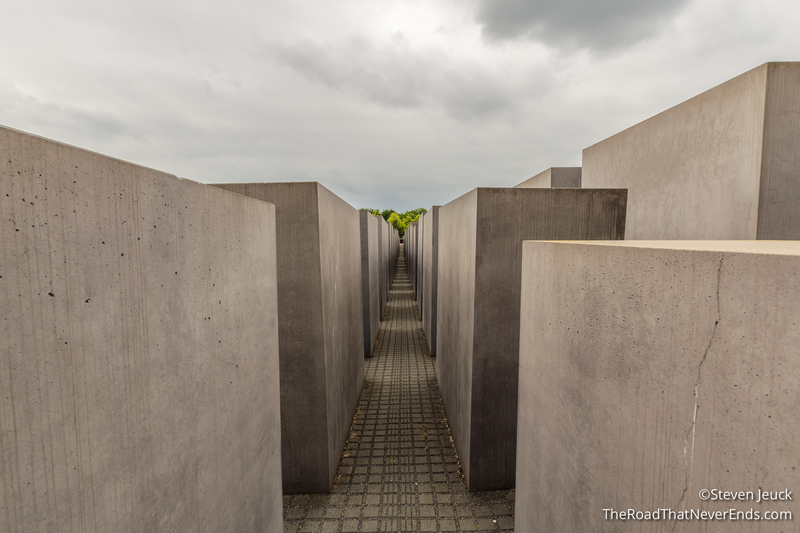 The stelae in the memorial is in a grid like formation but also uneven. The ground is also uneven, making the stelae varying heights to the visitor. The artist, Peter Eisenman, had this to say about interpretation, “The project manifests the instability inherent in what seems to be a system, here a rational grid, and its potential for dissolution in time. It suggests that when a supposedly rational and ordered system grows too large and out of proportion to its intended purpose, it in fact loses touch with human reason. It then begins to reveal the innate disturbances and potential for chaos in all systems of seeming order, the idea that all closed systems of a closed order are bound to fail.” The museum is about an hour worth of information, maybe more, and does have a wait. Like any Holocaust related museum or exhibit, it does tug on your heart and make for an emotional day.